Eden Prairie, MN (July 31, 2012) – In a new study published by Michigan think-tank, The Mackinac Center for Public Policy, IAF ranks 4th among ALL city/urban high schools in Michigan. The study, as cited in the July 20 edition of the Flint Journal, revealed that three of Michigan’s top schools were located in Flint, among which the International Academy of Flint (IAF) topped the list. “This is a wonderful endorsement of what the SABIS program can bring to a city in need through an outstanding school team such as IAF's,” stated George Saad, SABIS Vice President. The Mackinac study ranked all the state’s high schools based on college-readiness tests such as the ACT and the Michigan Merit Exam. The study also took into consideration factors such as poverty and other demographics in order to account for socioeconomic disparities among the schools. The Mackinac Center findings also indicate that IAF is ranked 8th among all Michigan public high schools and 5th among Michigan’s charter schools. Since graduating its first class in 2007, IAF has achieved a 100% college-acceptance success rate each year for all its seniors. 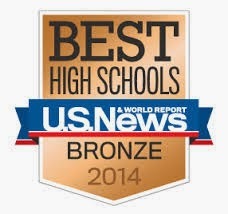 The school has received numerous awards and recognitions at the state and the national levels, including multiple awards from US News and World Report’s ranking of “America’s Best High Schools”. IAF was founded in 1999 and is a member of the SABIS School Network, a K-12 college-prep school network, serving students in 15 countries on 4 continents. IAF’s charter is authorized by Central Michigan University. For more information on IAF or on SABIS, please visit www.iaf-sabis.net or www.sabis.net.